And here is SEGA’s final foray into the gaming console world. The SEGA Dreamcast. 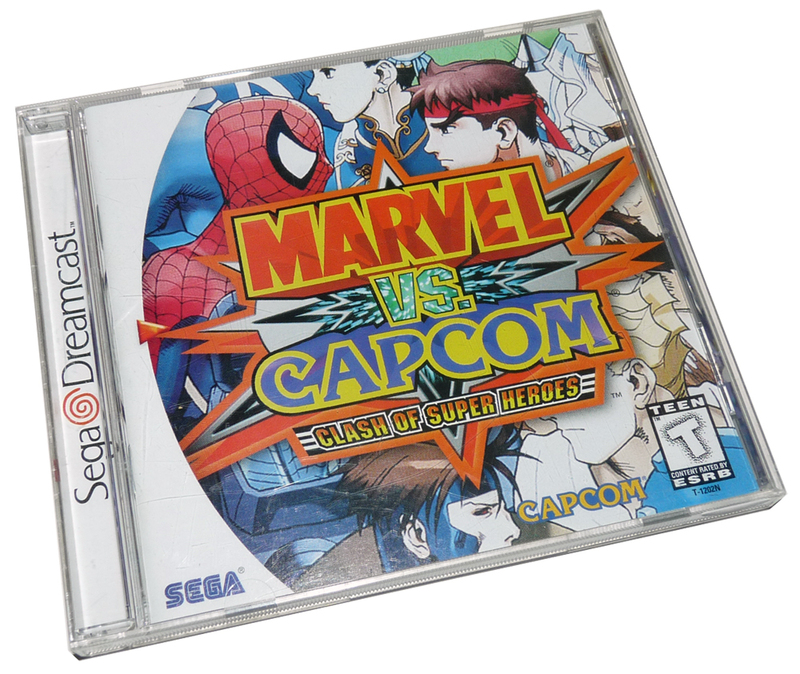 The Dreamcast beat the XBOX and PlayStation to the market in the 128 bit gaming war. I think we all remember the first time we saw one of the 2K sports series games running in one of the stores. I was walking into the mall through SEARS, and across the store I saw a football game on a TV. Only when I was very close to the TV did I realize it was not a live game, but the SEGA Dreamcast running NFL2K1…the new 3D gaming world had truly arrived to the console market. Another awesome feature was built-in online gaming! This was the first system to offer it on a grand scale with a great number of titles to boot. Phantasy Star Online, Quake 3, Unreal, Starlancer and many others gave me the first true online experience. Now as soon as Sony and Microsoft entered the playing field, SEGA phased out the Dreamcast—far too early if you ask me. But the SEGA Dreamcast had many a groundbreaking game that makes this system a must own for any collector. Don’t believe me? 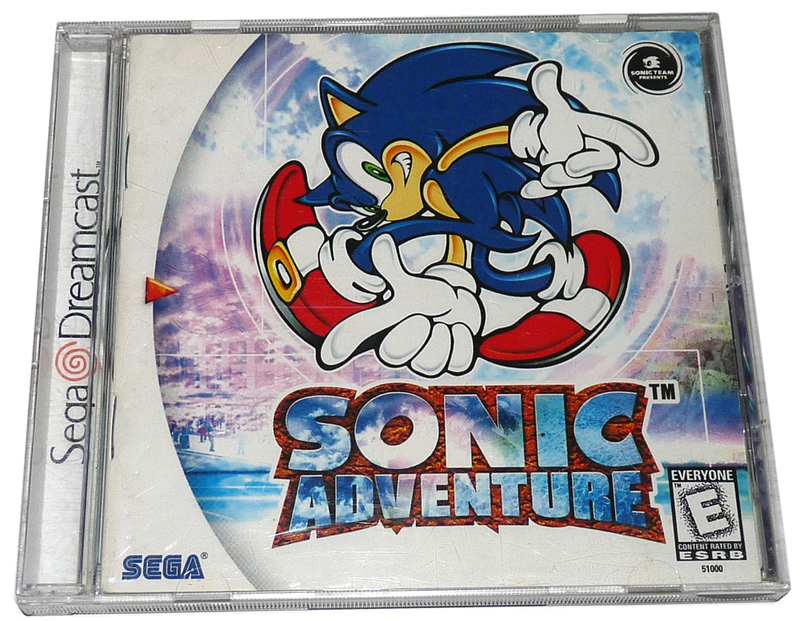 Let me list just a few reasons: Sonic Adventure 1 & 2 (the best 3D Sonic games made yet, and yes I’m counting any new ones), Marvel Super Heroes 2, Resident Evil Code Veronica, Jet Grind Radio, Skies of Arcadia, Power Stone, MDK2, and many more. 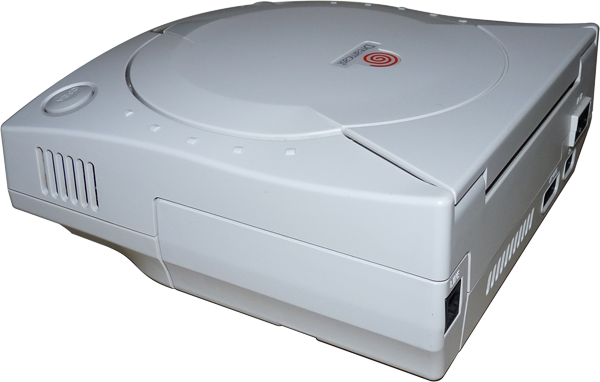 Since the SEGA Dreamcast was only manufactured for two years and as a result there were no major US revisions made. 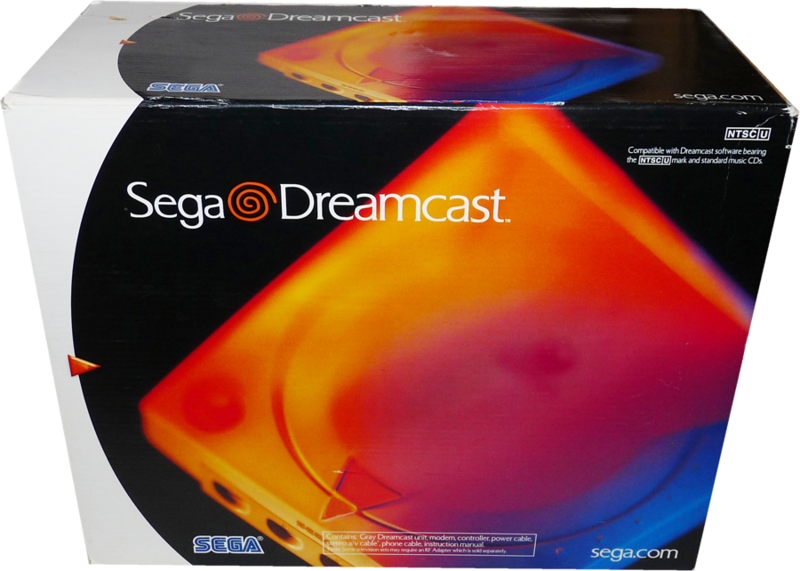 The original SEGA Dreamcast is off white in color with an orange power light (Orange is considered lucky in Japan!). 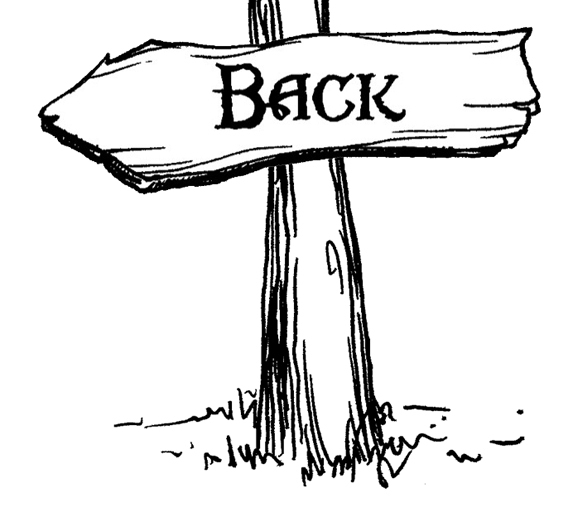 After 2000 the color was changed to a lighter shade of white. A different cooling fan was added to late model Dreamcasts and a different CD Drive, but no new model number was given. It has 4 controller ports and also came with a built in modem. The SEGA Dreamcast can also support a VGA box for truly stunning graphic quality, although it was shipped with a standard RCA Cable. 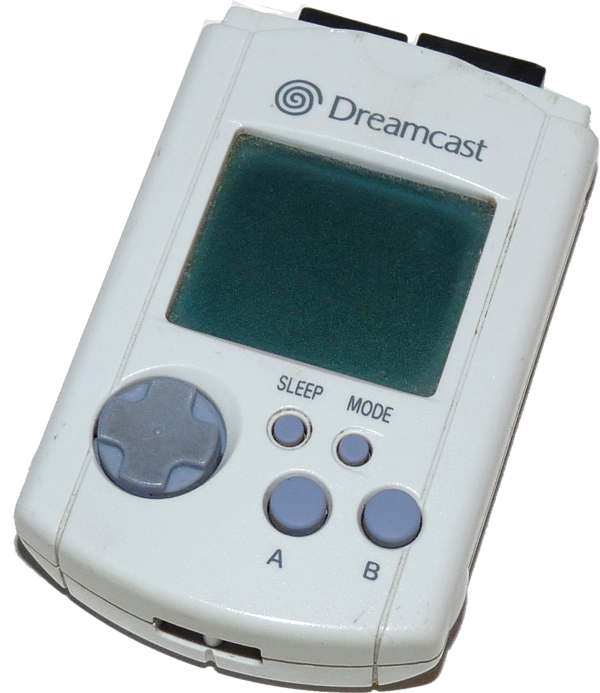 Memory for saved games was in the form of VMU (Visual Memory Units) That plugged into the controllers. Find out more about these and other peripherals in the EXTRA Section at the bottom of the page. 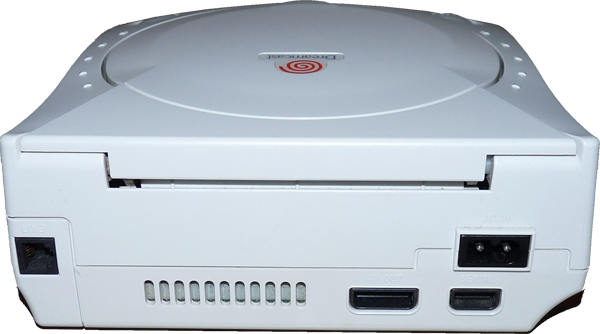 Overall the SEGA Dreamcast is a cool design that is much smaller than the previous SEGA Saturn system. With its nice racecar like curves and hefty weight it looks and feels like a soild built machine. Too bad this was SEGAs last system, I really like their designs! On the front of the Dreamcast you have four controller ports, following the Nintendo 64’s lead. As the years pass I have run into a few Dreamcasts that had problems with the controller ports. If your controllers stop working, then it is most likely a common resistor problem that is a very easy fix. One interesting note is the Windows CE logo on the right of the machine. SEGA made the Dreamcast programmer friendly (and wanted to show it) after lessons learned from the SEGA Saturn. On the top of the system you’ve got a Power Button on the left and an Open Button on the right. In the center is the power light. The clam tray door glides open nicely and these have held up well over the years. The left side of the SEGA Dreamcast is smooth with no ports. The right side of the machine has some cooling vents and sports an attached modem module. The modem module that came with every SEGA Dreamcast is a standard telephone jack as it is an old school landline/dial-up modem. You could however (and I did as soon as I could) buy a high-speed Ethernet version. Enough can’t be said about how cool and new this was for console gaming at the time. Previous systems dipped their toes into modems and online game play but not like this. With every Dreamcast shipping with a modem, developers could create online games knowing eveyone could play if they wanted to. And unlike modern systems, you could get a mouse and keyboard! I destroyed many a controller-player in Quake back in the day with that set-up. On the rear of the machine are the connection ports. On the left you have the modem connection with either the standard phone-jack port or an RJ-45 ethernet port depending on the modem installed. On the right is the AV OUT port, which uses a proprietary plug making it incompatible with any previous SEGA AV Cord. 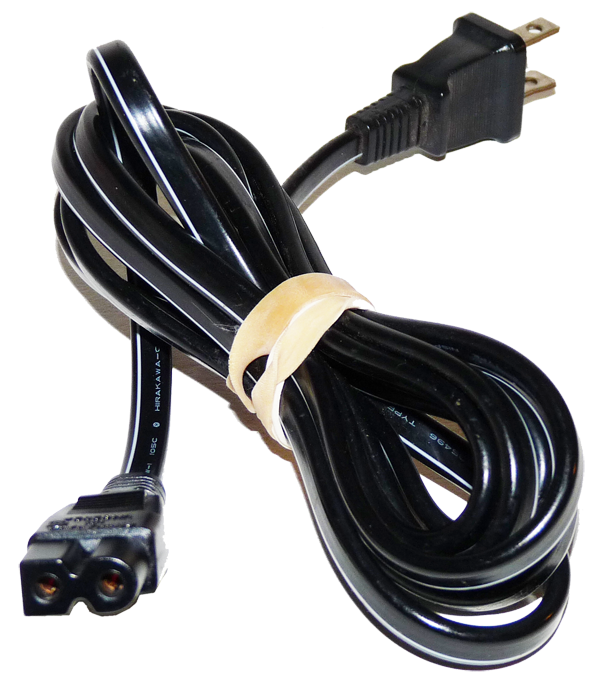 The AC OUT power port however still uses the standard 2-prong style cable like the SEGA Saturn. This one is keyed square on one side and round on the other, so the cable from the 2nd (round button) Saturn will fit. And on the bottom right is a Serial Port which could use a Dreamcast to Dreamcast system link cable and even had a Neo Geo Pocket Color link cable. Only a couple games used this feature though (Ferrari 355 and Virtual-On, I believe). If you need help connection the SEGA Dreamcast visit our HOW TO section. The SEGA Dreamcast shares the same key shape as the 2nd version of the Saturn. They are designed in such a way that a cable that works on the original model of the Saturn will not work on the 2nd version or the SEGA Dreamcast. But, the cable from the 2nd version Saturn and the Dreamcast WILL work on the original Saturn. 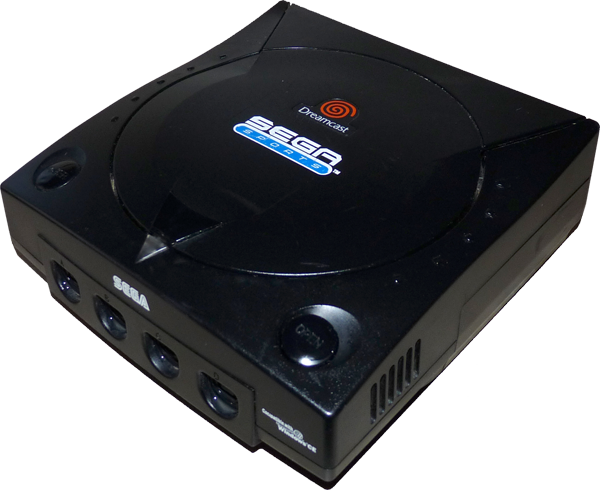 As far as I know, this is the only other version of the SEGA Dreamcast released in the US. While there were several variations in Japan, but I digress… The SEGA Dreamcast Sports Edition is a nice variation as it is in all black, just like every other SEGA system ever made. So you can color coordinate your SEGA collection! 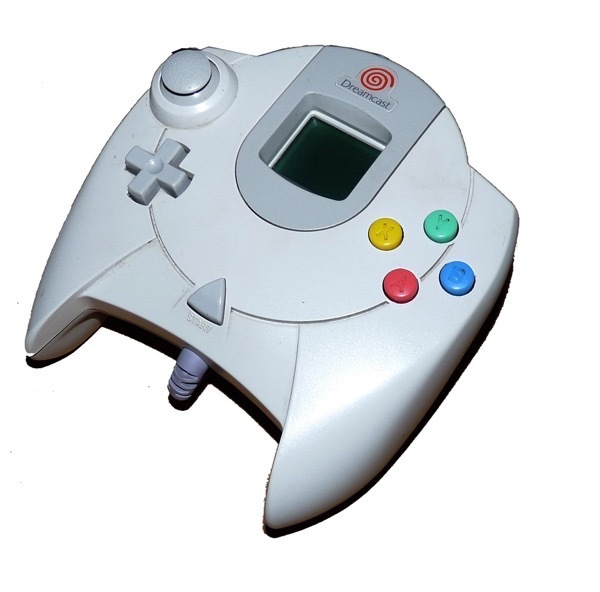 Other than the color, which was also applied to the included controllers, there are no differences from the original ‘white’ version of the Dreamcast. The SEGA Dreamcast has a decent controller. It is styled more like the SEGA Saturn 3D Controller than the smaller standard SEGA Saturn or Genesis controllers. This was the first time a system came standard with and analog D-pad. The Saturn one was released later in the Saturns life and was never packed with the system. 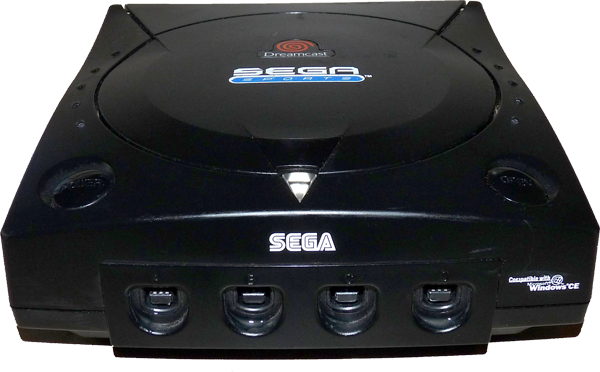 The action button layout also changed from the standard SEGA three over three layout and went with the north-south-east-west or ABXY layout. It’s a shame it didn’t come with the now standard double analog controllers that made 3D gaming much easier to navigate. Sony would soon get this right as would every console moving forward. The one bonus for the Dreamcast was that you can hook a mouse and keyboard up to it for many game and have a control method even better than double analog pads. The SEGA Dreamcast controller was still quite capable for 3D gaming. The new layout of the ABXY button would essentially act like a WASD layout everyone who plays on a computer/keyboard were used to. So for many game you move you character with he action buttons and look around with the analog page. Not as ideal or as smooth as a double analog but it works. In addition to the analog d-pad you had the old reliable digital version located right below it. This would often be used as additional action buttons or could be used for the same functions the analog stick controller. The digital d-pad is often preferred for fighting games (especially 2D) as it is easier to input quick back and forth actions for delivering the killing blow. At the bottom center face of the controller is the start button and at the top is a large gapping hole! This whole actually allows for the viewing of another cool feature of this controller, the VMU. SEGA Visual Memory Unit (see below). The controller actually has two slots for a VMU on the back. The top spot is the only one that would display the screen but the bottom slot could be used for other VMU options like a rumble pak or the micro-phone VMU. Or you could plug in two memory VMUs. The controller has grips underneath for both hands with a single trigger style button on both sides. The cord for the controller actually comes out of the front/bottom (as the VMU ports took up the space on the back). There is an indention on the bottom of the controller that you can tuck the cord into so that is is diverted backwards. 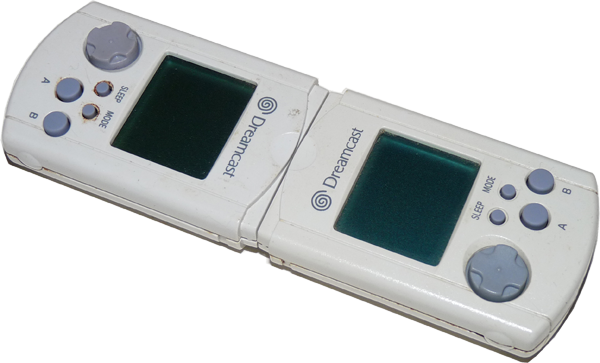 These little devices contained 128k of memory for saving games on the Dreamcast. But, instead of just serving as a memory card they have a little mono-lcd screen and a tiny d-pad and four action buttons! They’re like little gameboy things. Many games came with little add-on games or functions that would be accessed using the VMU. 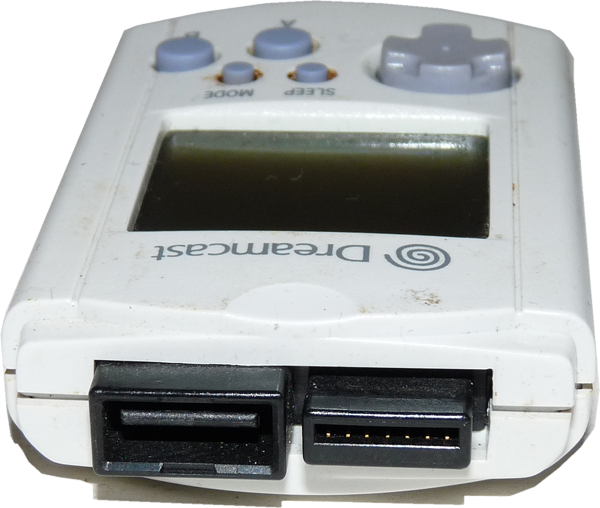 This could even be used when the VMU was removed from the controller and carried around. One of my favorite functions was that it could display in-game information like character stats, maps and more. For football games, for example, you could have your next play options displayed on the VMU and not the TV! This was a great way of not showing your buddy sitting right next to you what you were calling. When the VMU’s were removed from the controller you could hook two together to transfer saved games and data. 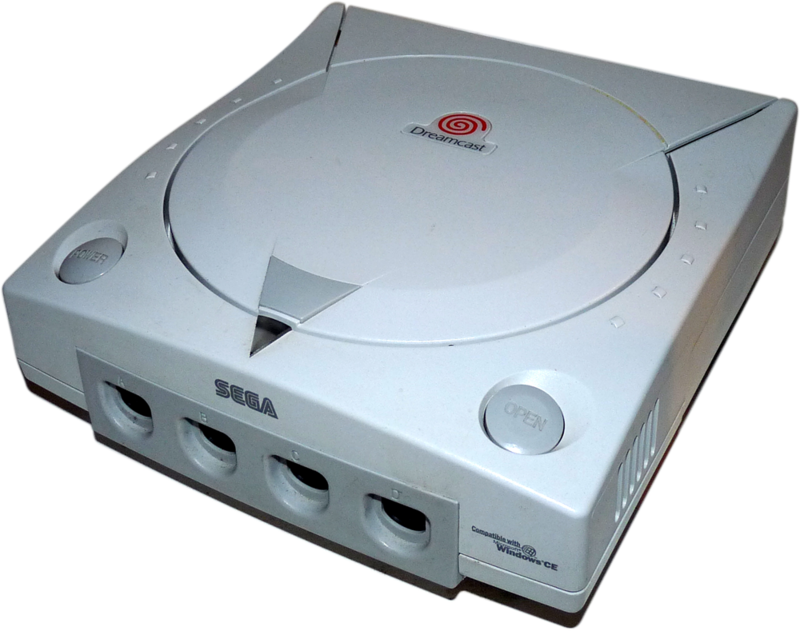 The SEGA Dreamcast was our first view of the 128-bit generation of game consoles. And with it brought a new level of detail and refinement to 3D gaming. The Dreamcast was a powerful machine and had some stunning looking games that you can still very much appreciate today. Soul Caliber and Dead or Alive are two games that come to mind. The SEGA Dreamcast also brought us our first true 3D Sonic games and perfect copies of some of SEGA arcade classics like the House of the Dead. And on top of all that we now had online multi-player gamins like Phantasy Star online and others! 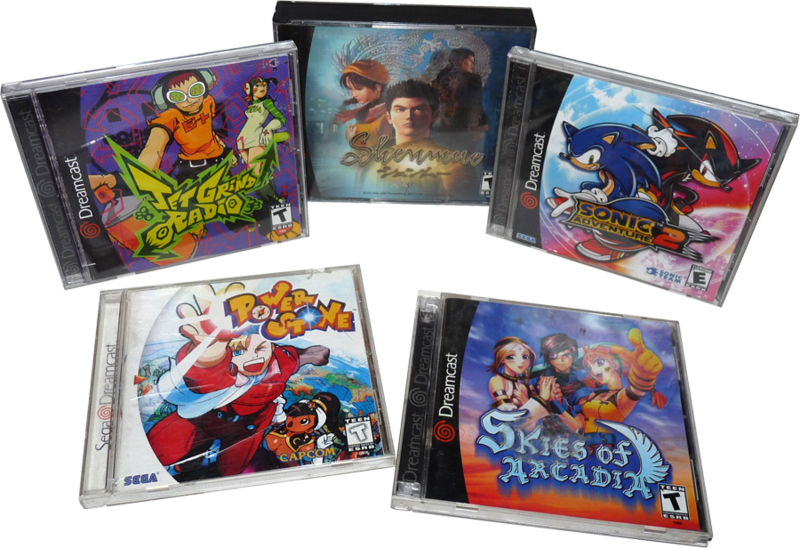 With the Dreamcast, SEGA finally moved on from the large SEGA Saturn / SEGA CD game cases and went with the standard CD jewel case. I’m sure retailers were happy with this move as they take up far less space on the shelf. 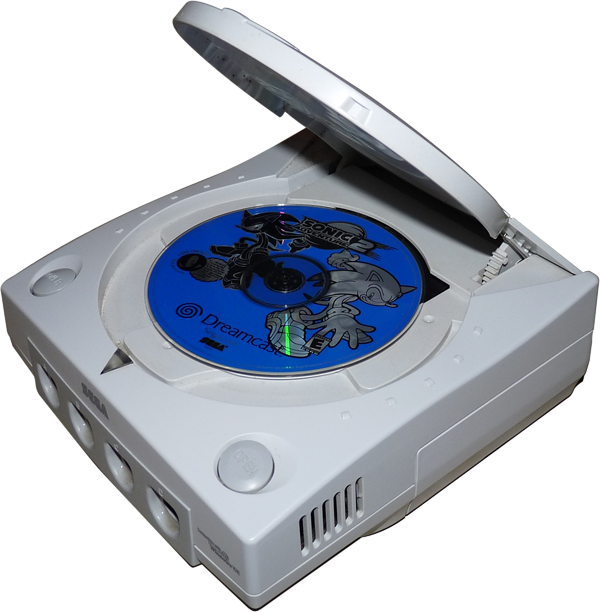 The SEGA Dreamcast uses a GD-ROM disk, which is basically a higher storage capacity CD (it would hold up to 1 gig). With the move to the smaller CD jewel case, the game manuals had to get smaller also. The front cover for the case is also the manual. With this small case these guys have held up as well as any music CD case, which is good. And if your game case gets cracked or broken it’s very easy to switchit out with a new case.